The Future will be collaborative or won’t be. That is a certainty for INTRAW. Not just a simple belief that our future would look brighter if Europe collaborated with International Partners, but an actual, deep faith: There is no Future for the EU without close collaboration among the strong mining countries from across the globe. That faith defines INTRAW. It is its DNA, the one that gave birth to the International Raw Materials Observatory on 7 November. And the one that could not wait more than 24 hours before putting theory intro practice with a whole exciting day of intense collaboration. … and the possibilities are endless. 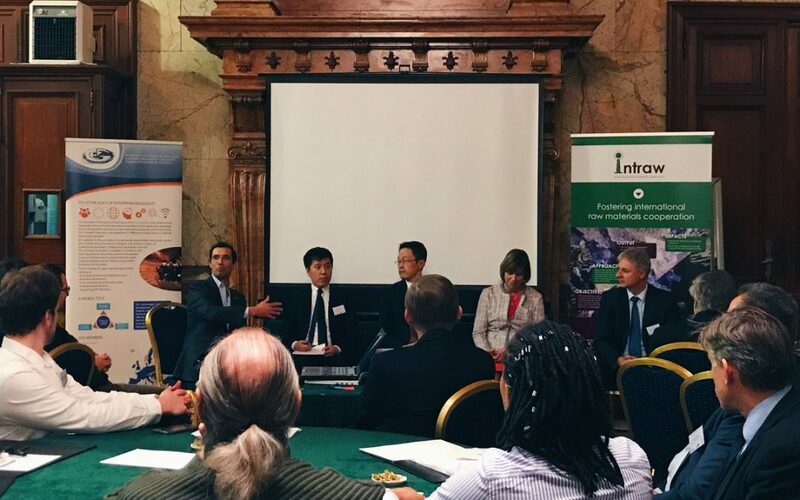 A collaboration between H2020 projects too, with a roundtable co-organized with FORAM on the challenges associated with the exploitation and trade of raw materials. Five speakers, representing the wide range of raw materials sectors, exchanged during the entire afternoon with a cross-disciplinary audience on an even wider range of topics, from social and political contexts to technological trends, policy gaps and opportunities for international cooperation. The outcome? A long list of future challenges, but a certainty: when partners look in the same direction, there is nothing holding them back.